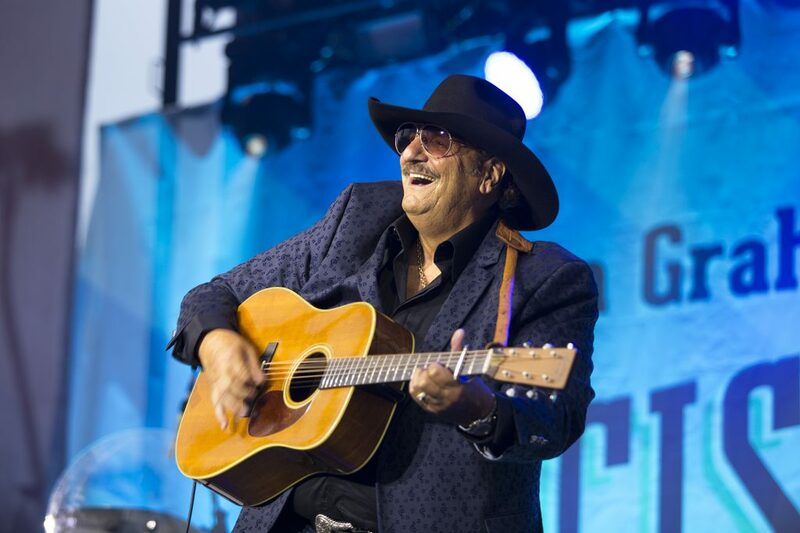 It was 1967 when God gave 19-year-old Dennis Agajanian the opportunity to tell members of the Hell’s Angels about Jesus Christ. Some members of the notorious motorcycle gang were at a coffeehouse on the Berkeley Campus of the University of California where Dennis was playing guitar and singing secular and Gospel songs. That moment was pivotal in the life and ministry of a man who has been called the world’s fastest flatpicking guitar player. It emboldened Dennis to continue doing the work of an evangelist as the Bible instructs in 2 Timothy 4:5. Dennis picked up a guitar for the first time when he was 15, and before long was playing in a bluegrass band. As his abilities developed over the years, he became famous for his fast picking skill in instrumentals, bluegrass, and Gospel music. He has shared the stage with Johnny Cash, Charlie Daniels, Ricky Skaggs, Michael W. Smith, and Darius Rucker. In addition, Dennis has written the music for three movies and three ABC TV specials, and recorded almost 20 albums. Dennis committed his life to Christ in 1959, at age 11, when a friend invited him to a youth event at a church near Los Angeles. They arrived and found only four other people in attendance. But the youth pastor was undeterred; he preached the Good News and the Holy Spirit opened Dennis’ heart to the mystery of the Gospel. Dennis responded to the pastor’s invitation. “Are you sure you know what you’re doing?” the pastor asked. “It all made sense that Jesus would want to save me (from judgment),” Dennis says. At that time, Dennis was playing trumpet. Four years later, he switched to guitar, and four years after that, in 1967, he started playing songs that glorified Christ. That resulted in his invitation to perform in the Berkeley coffeehouse the night he met Billy Graham. Dennis crossed paths again with Billy Graham in 1974 after Cliff Barrows, Mr. Graham’s music director, heard him play at a California outreach event led by Canadian evangelist John Wesley White. Cliff liked what he heard and asked Dennis to be part of the worship team at a Texas Crusade the following year. Dennis played at that event (where he first met Franklin Graham) and gave his musical testimony at more than 40 other Billy Graham Crusades throughout the years. 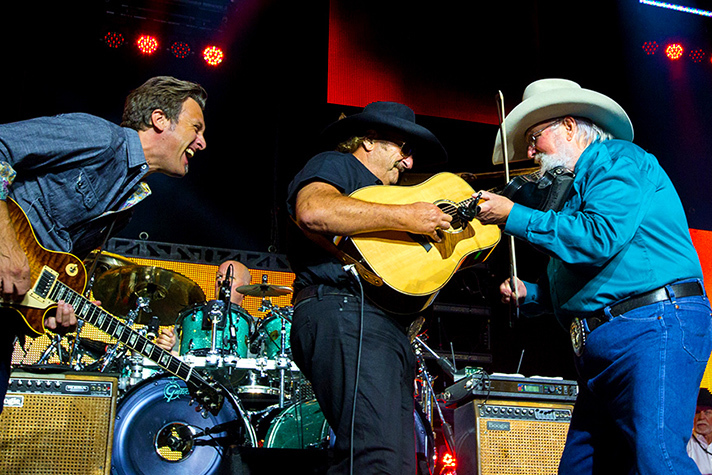 Dennis Agajanian performs on stage with Charlie Daniels at the Franklin Graham Festival in Jacksonville, Florida in 2015. One highlight was performing at a 1994 Billy Graham Crusade in Tokyo. “For me to play a Japanese guitar and Japanese music, in the sold-out Tokyo Dome (with a seating capacity of 55,000), was such an honor,” Dennis said. Meanwhile, finding they had many mutual interests, including motorcycle riding, Dennis and Franklin became friends. “I always liked Franklin’s messages and I told him he should preach, but he didn’t want to be compared to his dad,” Dennis said. When Franklin began leading evangelistic Festivals, Dennis became a regular musical contributor. He has participated in more than 200 so far. Dennis has often played and sang in Canada, and says he appreciates “the politeness and kindness of Canadians.” He’s been part of the music and testimonies at Franklin Graham Festivals in Vancouver, Toronto, Winnipeg, and Calgary, plus Franklin-led Rock the River youth outreach events in Ottawa, Winnipeg, Calgary, Edmonton, and B.C’s Fraser Valley. He has performed and shared the Gospel at other BGEA-led events in Canada, including a memorable 2014 appearance at the medium-security Drumheller Institution in eastern Alberta. Dennis has also worked alongside Franklin’s son Will Graham, a BGEA vice president and an evangelist who preached at the November Prince Edward Island Celebration of Hope in Charlottetown. “Will has a great heart, and he’ll carry on the organization someday,” predicted Dennis, who brings Will to southern California every December for a six-church Acoustic Christmas tour. Modeling himself after Billy Graham, who didn’t retire from public preaching until age 86, Dennis has no intention of using his age (69) as an excuse to slow down. In fact, he has a personal trainer and exercises regularly to ensure he can continue travelling and performing. As he continues performing, Dennis also continues telling anyone who will listen about the love and salvation offered by Christ.